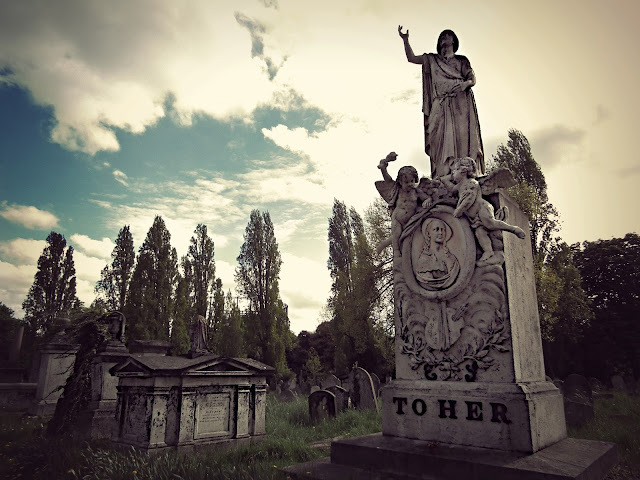 Alexis Benoit Soyer’s ostentatious display of grief for his 29 year old wife Emma Jones stands opposite the Upper Gate in Kensal Green Cemetery, a few yards away from the endless traffic and scurrying pedestrians on the Harrow Road. It’s size and position demand attention even during the day but by night, at least when it was first built, it was illuminated by gaslight, and must have been a truly uncanny sight for anyone who peered in through the cemetery railings into the dark and deserted burial ground. Emma was an artist and her husband displayed her palette and brushes like holy relics in a glass fronted niche at the back. 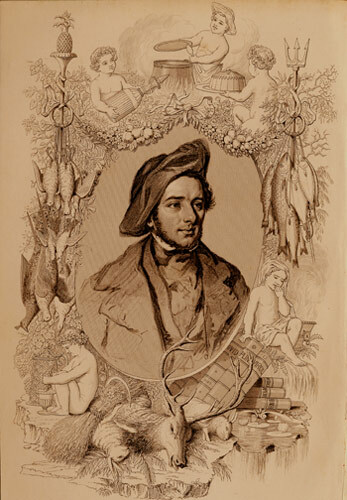 Alexis Soyer was a celebrated culinary artiste, a Frenchman who fled the 1830 revolution in Paris to join his brother in London who worked in the kitchen of the Duke of Cambridge. In time became the most renowned chef de cuisine in England, running the kitchens of the Reform Club, opening his own restaurant in Gore House, Kensington, authoring numerous books on cookery and advising the British government on the Irish famine and feeding the troops in the Crimea. The famous portrait of Alexis Soyer used as a frontispiece to many of his books was by Emma. Elizabeth Emma Jones was born in London in 1813. 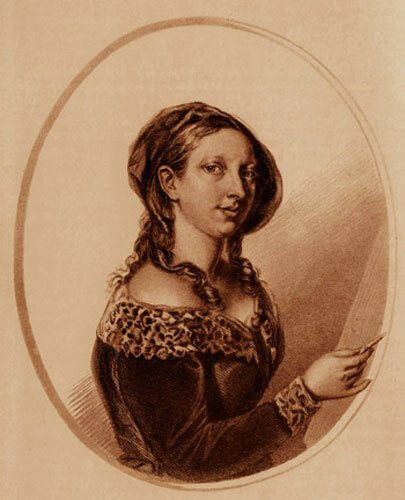 She was a precocious and talented child, an accomplished pianist and an artist who first exhibited at the Royal Academy at the age of ten. She was tutored by Francois Simonau a successful Flemish artist who subsequently married her widowed mother. In 1836 Alexis Soyer paid a call on the francophone artist and was immediately entranced by the artists stepdaughter. Simonau and Emma’s mother were not keen on Soyer as a suitor as a chef de cuisine, even a successful one, was considered somewhat déclassé. Emma had no such misgivings however and her determination to marry Soyer eventually wore her parents down. The two were married on the 12th April 1837 at St George’s, Hanover Square. It was a happy marriage. Soyer was supportive of his wife’s artistic ambitions and the death of her mother in 1839 and the inheritance of her fortune allowed her the freedom to pursue her art. In her short life Emma produced over 400 paintings and nearly a 1000 drawings and she was good enough to exhibit not only at the Royal Academy but the Paris Salon. Her husband took every opportunity to promote his wife’s work – at the Reform Club he had the kitchens hung with her paintings, in the chef’s parlour there were at least 20 which he showed off to every important visitor who came to visit his famous kitchen. One visitor, Queen Victoria’s uncle, Ernest I the Duke of Saxe-Coburg, was so impressed by Emma’s paintings that he suggested that Soyer accompany him to Brussels where he would introduce him to King Leopold 1 of Belgium who he thought might be keen to commission a work. Emma was pregnant but with some misgivings, as they had already lost one child through a miscarriage, Soyer decided to take up the offer. Whilst Soyer was away London suffered an unusually intense summer storm, the rain had come down in torrents and there had been thunder and lightning all day. Emma reacted badly to the continual rumble and roar of the thunder, appearing agitated and nervous. Eventually she retired early to bed where she was discovered dead by her maidservant two hours later. Soyer was distraught when he heard the news. His immediate reaction was to try and stab himself. His Belgian friends wrestled the knife off him and dragged him into the garden where it took them two hours to calm him down. He never forgave himself for his absence from home and never really recovered from the death of his young wife. 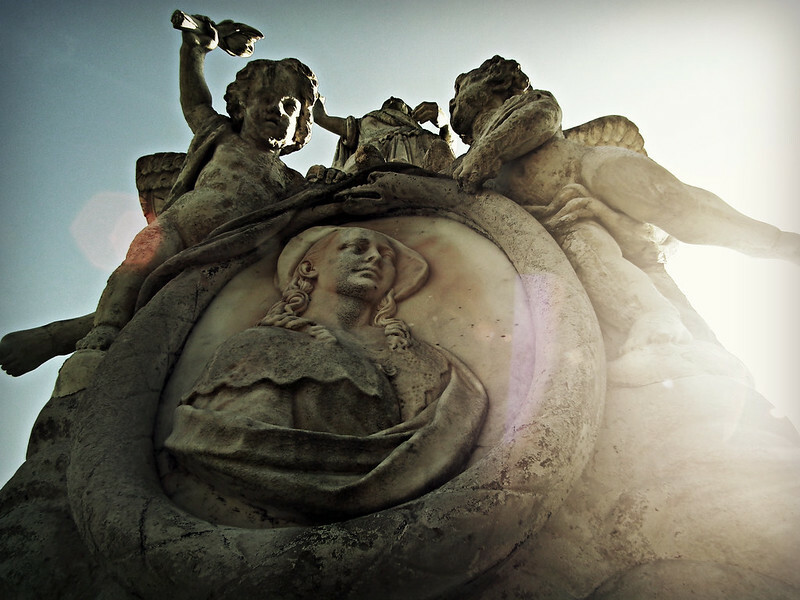 He tried to buy back all of her paintings that had been sold so that he had every single one of her works (many people would not part with them however) and he commissioned the impressive funeral monument to her at Kensal Green. He was buried with her when he died in 1858. Also buried in the plot are Emma’s stepfather Francois Simonau and oddly a Lady Watts, Francois’ grandniece, who had herself interred here in 1929.